he Hodogaya Chemical Group has its own risk management system in place to minimize damages associated with illegal acts against the Group, quality issues, natural disasters and other risks. In order to maintain and increase corporate value, to fulfill corporate social responsibilities, and to achieve sustainable growth of the Group, all officers and employees are engaged in initiatives to increase risk awareness and promote risk management. Hodogaya Chemical has a Risk Management Committee in place, in accordance with the Risk Management Committee Rules. 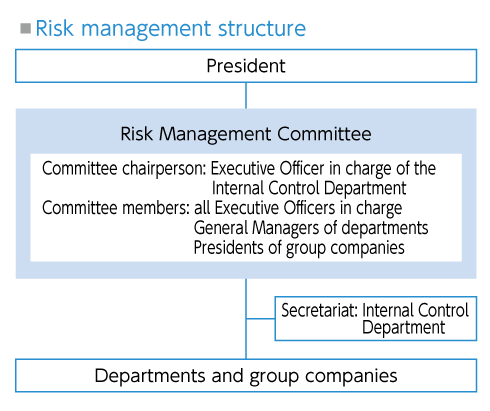 The Committee holds regular meetings to share risk awareness, develop measures to reduce risks, review the progress of such measures, and take initiatives to minimize damages, on a group-wide basis, in accordance with the Crisis Management Rules. As for information securities, we are formulating internal rules and regulations to store and manage information appropriately, and conducting educational activities such as the compliance training. The Hodogaya Chemical Group formulates various rules and regulations based on the Basic Policy on Internal Control, and strives to achieve compliance through organized and cross-sectional initiatives led by the Internal Control Department. The Internal Auditors Department audits the status of compliance and provides advice and guidance for improvements if necessary. Hodogaya Chemical has formulated the Corporate Code of Conduct, the Compliance Action Policy, and other compliance-related policies and rules. All officers and employees of the Hodogaya Chemical Group abide by these rules and act in accordance with laws and regulations, the company’s Articles of Incorporation, and the social norms. The Corporate Code of Conduct sets forth the guiding principle that the companies, officers and employees must follow in all corporate activities undertaken by the Hodogaya Chemical Group. The Compliance Action Policy clarifies in a more comprehensible manner the Corporate Code of Conduct which sets forth the matters that must be observed in executing operation, based on the understanding that it is essential for the sound development of the Hodogaya Chemical Group for all of its officers and employees to have complete understanding of the social responsibilities of the Group, to ensure full compliance of relevant laws and regulations and internal rules in all aspects of corporate activities, and to behave in accordance with the social norms. The Hodogaya Chemical Group will respond to the social demands and expectations by duly fulfilling its tax obligation in each country and region, as stipulated in the Corporate Code of Conduct and the Compliance Action Policy. To do so, we work to maintain and improve tax compliance through actions such as formulating structures to accommodate various taxation systems, cooperating in submitting tax information to the tax authorities in a timely and appropriate manner, and not engaging in intentional tax avoidance through income transfer to other countries or the use of tax haven. The Hodogaya Chemical Group has set up an internal reporting system under its Internal Reporting Rules in order to ensure early detection and prevention of violations of laws and business ethics. Reports are received by the Internal Control Department and outside legal consultants. The system ensures that, in conducting investigations based on reports, the privacy of the reporters and the secrecy of the content of their report are protected to the maximum extent possible. The protection of reporters is clearly stipulated in the Internal Reporting Rules and utmost care is given so that a reporter with honest intentions do not receive any disadvantageous treatment such as dismissal, displacement, or discrimination as a result of their reporting. In terms of cultivating and improving compliance awareness, the Hodogaya Chemical Group continuously offers compliance training sessions and independent education using e-Learning for all Group officers and employees, in order to thoroughly ensure compliance. In addition, officers and managerial personnel of the Group are required to take the Examination of Compliance Proficiency for Practical Business (Primary Level) to gain knowledge and increase understanding of compliance.